All these can be yours, for a (to be determined) price. I’ve been an Apple user long enough that the company’s regular keynote events are a recognisable form of entertainment. Unusually, I didn’t watch this week’s well-publicised event until the day after it happened. (Possibly a good thing given the problems that the live streaming coverage faced.) By that time I’d already read enough of the media reaction to know exactly what I’d be seeing. Spoilers aren’t really the point with an event like this. The first part of the event, to be fair, had already been well spoiled by leaks. Enough prototype parts and schematics had trickled out from Apple’s supply chain that only a few details remained to be filled in about the new iPhones. The 6 and 6 Plus looked much as expected and neatly relegated last year’s 5s and 5c to the minor places in Apple’s product lineup. A one-year-old free (on contract) iPhone is a better trick than a two-year-old free offering, but the 6 and 6 Plus are now the stars. The former seems the better bet, though the 6 Plus has its own appeal if you can handle its unwieldy dimensions—in its case, battery life and an improved screen are bigger draws than the optical image stabilisation of its slightly protruding camera. Next up after the phones was something only hinted at in pre-show leaks: Apple Pay. A solution to the hassle of everyday credit card payments, it positions Apple well in the race to made commercial life more convenient. It’s the biggest leveraging to date of Apple’s credit-card enabled iTunes customers, bringing together a lot of pieces (iBeacon, Passbook) that Apple has been putting into place for some time now. However, given that it’s only usable with NFC-enabled devices (both the iPhone 6 and 6 Plus, as well as this article’s titular device) and is only to be deployed in the U.S. for the moment, its reach will initially be limited. Over the long term though, it could well be the most important announcement of the entire show. Last up was the fabled “One More Thing,” returning to a very warm welcome from the crowd. This was, of course, the Apple Watch, likewise rumoured in the media but barely even glimpsed in advance of the show itself. It seems that Apple’s secrecy can still hold when they really need it to. 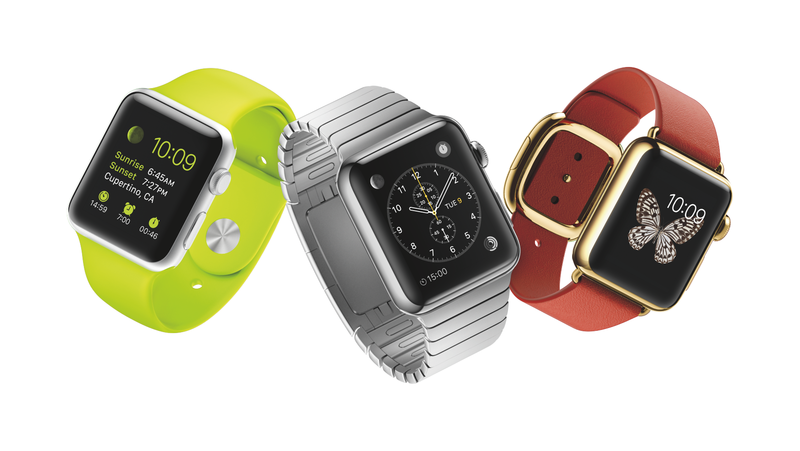 A handful of smartwatches have already hit the market. I owned one briefly, in the form of the Pebble, but most of them are now running Google’s Android in one form or another, and yet more are on the way. If the Apple Watch is going to be a success, Apple’s going to have to repeat a trick it’s already pulled with the iPod, iPhone and iPad: to enter an existing but nascent market and turn it upside down. So has it done so? Well no, not yet, if only for the reason that the Apple Watch won’t be released until early next year and many important facts about it remain uncertain, but at least one watch industry watcher has been impressed by the unveiling, not just its implications for the smartwatch industry but for watches in general. Whereas its competitors seem to have focused primarily on providing an adjunct to their Android phones, Apple is coming from the other direction. The Apple Watch is tethered to the iPhone (or possibly the iPad too?) true, but it’s as much a fashion accessory as it is a computing accessory. The fact that Apple paid attention to what people might actually want to put on their wrist can be seen in the simplest fact about the Apple Watch: it comes in two sizes, small and large. Just like non-smart watches do. Physically, it’s arguably more attractive than any of the other smartwatches already out there. More importantly to potential buyers, it’s massively customisable, more so than any other Apple product before it. Between size, colour and strap type, as long as you fancy having an Apple Watch on your wrist, you’ll be able to make it look exactly the way you want it to. Moreover, Apple has gone to great lengths to design its straps so that you can fit and adjust them yourself, rather than heading to a jeweller to have it done for you, as is the case with several of the Android smartwatches. As for the software, it certainly looks the part, with Apple once again tailoring an operating system to suit the device. The Apple Watch has a touch screen, but given that any touching finger would obscure a significant portion of the screen, it also has a “digital crown,” refashioning the traditional watch crown into a multifunction control wheel with an integrated home button. Another button devoted to bringing up a “favourite contacts” screen is a reminder that the Apple Watch, above all else, is meant to leverage the power of its linked iOS device, faster and with greater ease than ever, and preferably without needing to take it out of your pocket or bag. As for whether I plan to get one or not, that depends. Depends on the battery life of the final device and the price of the various options. Depends on whether or not the eventual software manages to live up to the promises of the keynote speech. For, whatever else it may be good at, Apple is very good at selling its devices as objects of desire. I’ll be looking out for reasons not to break open the piggy bank come early 2015. It’s up to Apple to match its own hype. Until then, I have iOS 8 (coming next week) and OS X Yosemite (coming a little later) to refresh my own devices, making them seem like new again. There’s a new U2 album as well, offered as an awkward freebie at the end of the keynote, but that can’t really compete as an attraction. After all, what we get for free, we never really appreciate as we should.